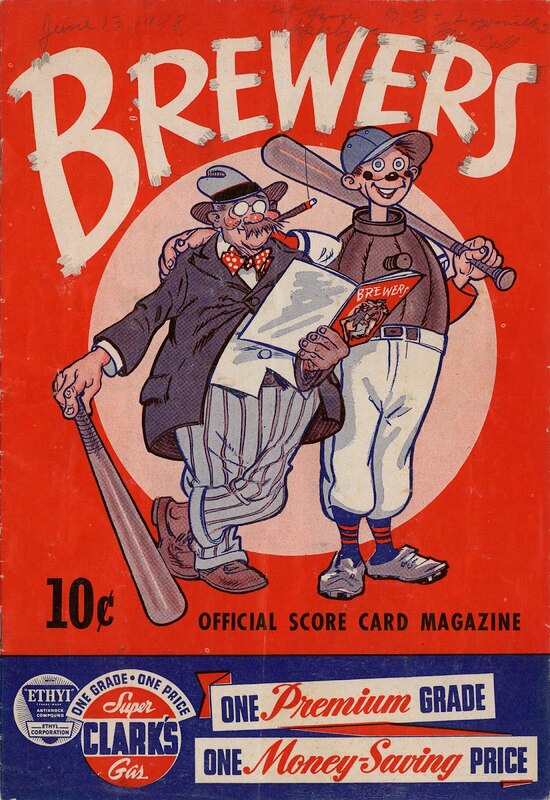 Today's score card study is this gem from 1948. 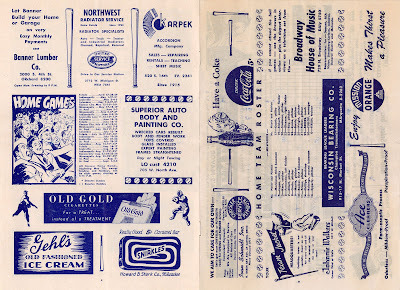 June 13, 1948, to be precise; the original owner has helpfully pencilled in the date and final score across the cover (along with a little creative doodling). 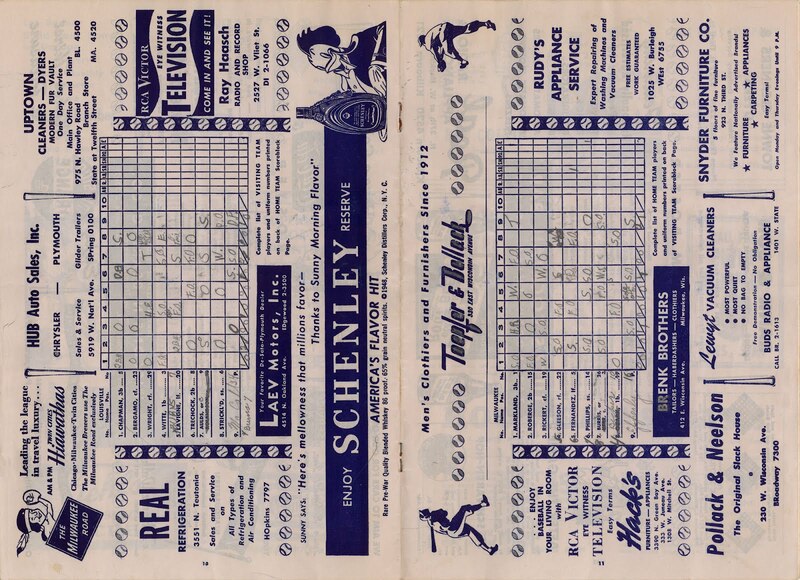 That day, the Borchert Field faithful saw their Brewers dispatch the Louisville Cardinals 3-2. It's smaller than the score cards we've looked at before, measuring in at just 10x7 inches. The cover has an interesting graphic, depicting a youthful beer barrel man (really a beer barrel boy), with his arm around an older gent. Is that supposed to represent a particular person, perhaps one of the club's Boston-based owners? Bonus points also for the recursive cover on the program he's reading. 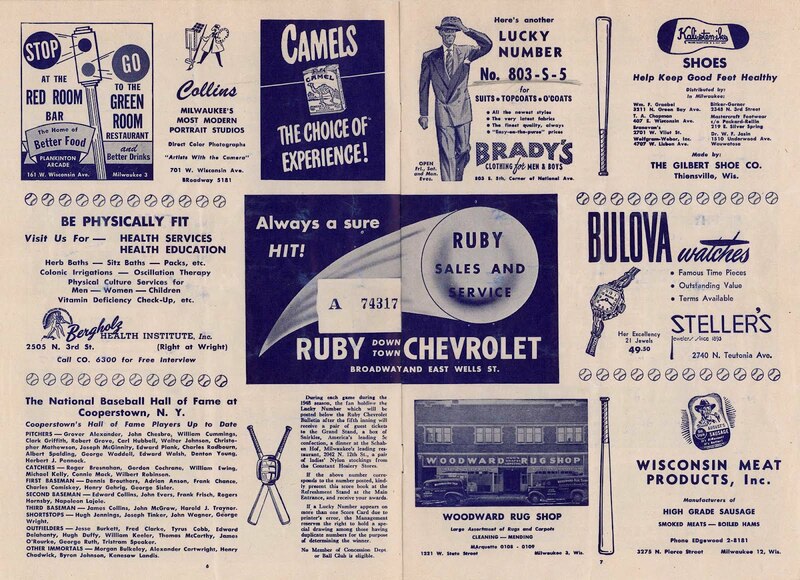 The cover, as always, was sponsored by Clark's service stations. 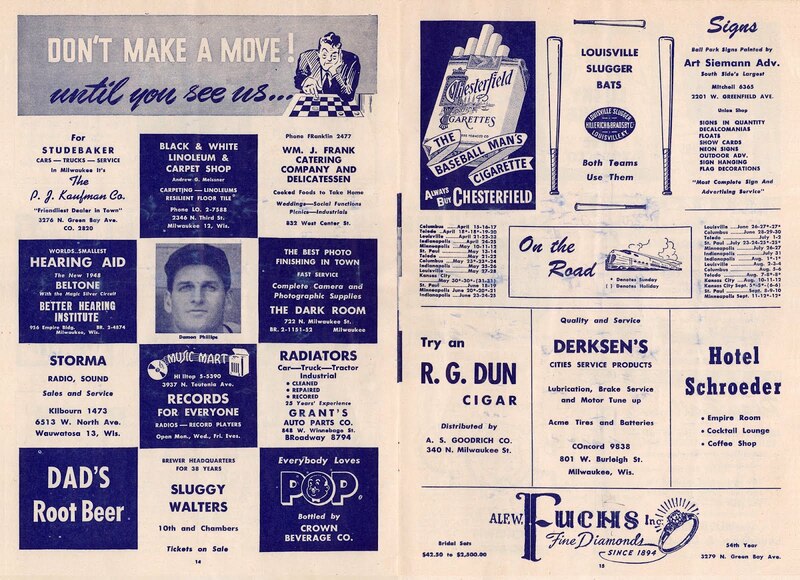 And like all score cards, this exemplar is stuffed with local advertising. The interior cover features a pair of marvelous ads, one for "Miss Secretary" hosiery and the other for Gimbels, your exclusive source for Spalding sporting goods. Note the pitch for Mickey Heath's play by play on WEMP, "when you can't make the game." 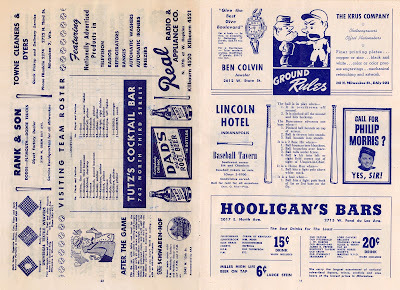 The next page features a "state of the team" page, with photos of the club's president and skipper under a marvelous graphic of Owgust as both pitcher and catcher. 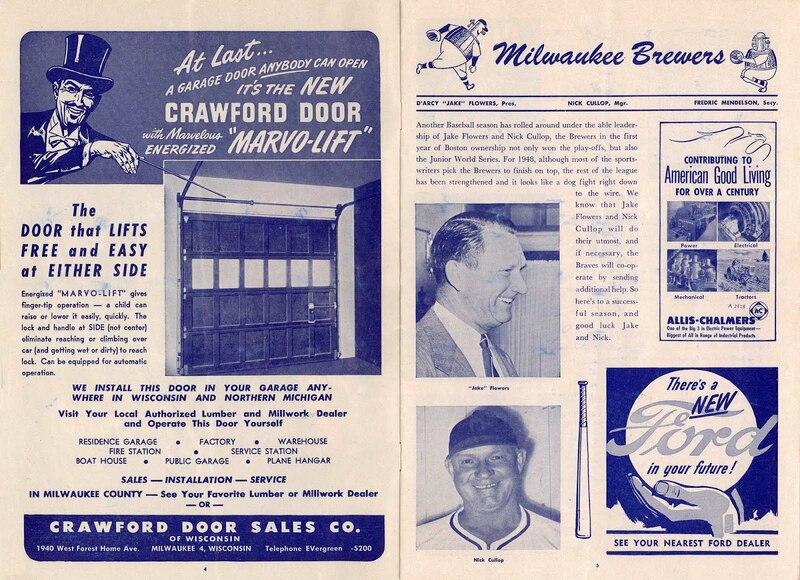 Brewer fans would need no introduction to these two men, who had steered their club to the American Association pennant and Little World Series Championship the previous year. 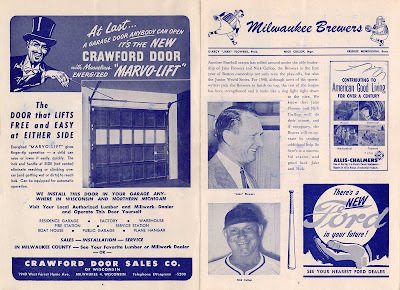 D'Arcy "Jake" Flowers had been installed in Milwaukee as president and general manager of the Brews by the club's Boston owners in January of 1947. He had been a coach of the Braves in 1946, and coached for the Pittsburgh Pirates for six years before that. Manager Nick Cullop, affectionally known as "tomato-faced," had been the Brews' skipper since 1945. 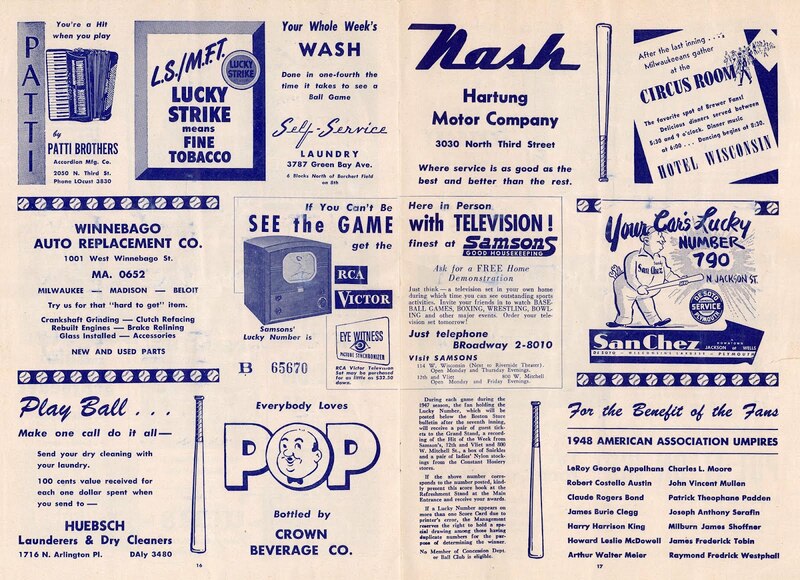 The Brews managed to stock their score cards with much information, amongst all the ads. 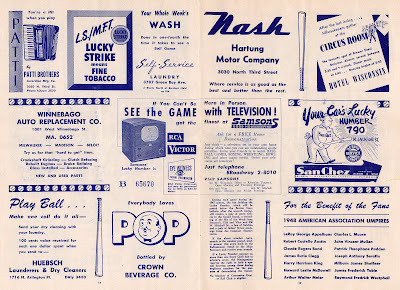 This page includes a "lucky number" contest and list of inductees to the National Baseball Hall of Fame in Cooperstown, then not quite a decade old. 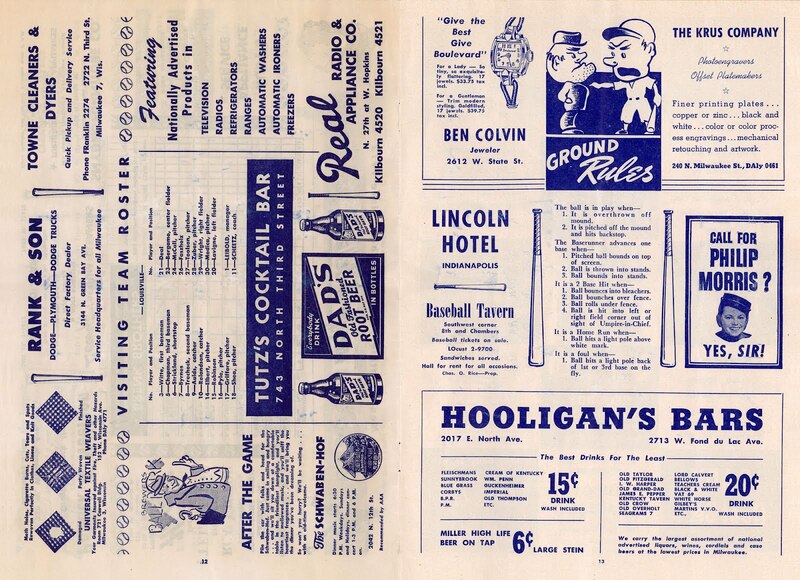 Here there is a list of home games at Borchert Field, and the Brewers' lineup for the game. 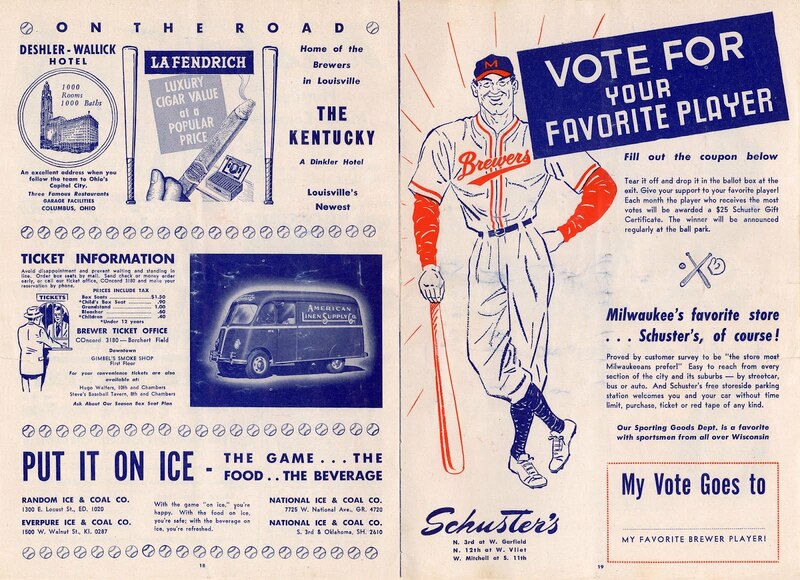 I love the baseball-themed dividers. 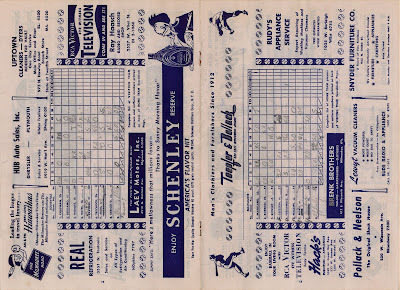 Then we get to the meat of the program, the inning-by-inning score card itself. These pages are printed on thinner newsprint, making them appear darker here. Of note is future Milwaukee baseball stalwart Johnny Logan, wearing #2 and listed as a "utility player." Logan had come to the Brewers that spring from the Braves' farm team in Evansville, Illinois. 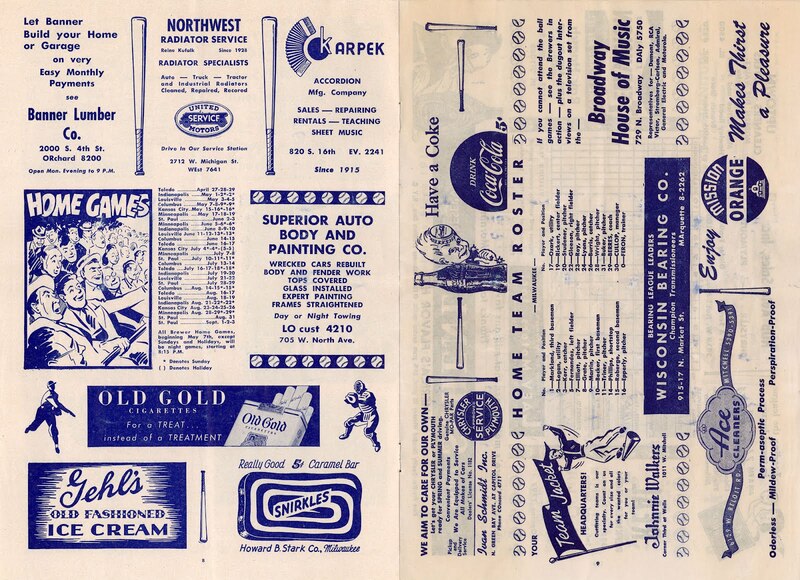 He struggled in his early days with Milwaukee (spending this particular game on the bench) and was sent down to the Texas-league Dallas Eagles on June 24, just days after this game was played. 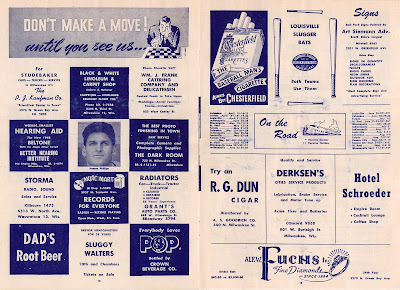 It was just a minor bump on Logan's road to the majors, and he would be back with the Brews for a full season in 1949. Following this, we have the Louisville lineup, and a fantastic "Ground Rules" graphic. Arguing with the ump is an important image in baseball iconography. Look at the checkerboard design here, crowned with a pensive player. Fantastic design. Infielder Damon Phillips came to Milwaukee from Boston before the 1947 season. He was an important part of Milwaukee's lineup in that first season, driving in two RBI to help keep the Brewers from falling behind the Syracuse Chiefs 0-3 in the Little World Series. Cullop's Brews were able to return to Borchert Field only down 1-2, and came from behind to take the minor league championship. Another "lucky number" contest, this time from Samson's store, and a clever parody from San Chez motors. This is my favorite page in the entire program. 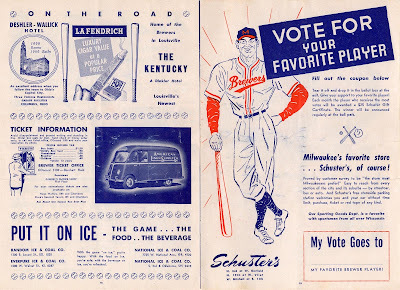 Partly for the information on Brewer ticket outlets (the smoke shop at Gimbel's, as well as Hugo Walters and the delightfully-named Steve's Baseball Tavern), but mostly for the Schuster's "Vote for your favorite player" ballot. 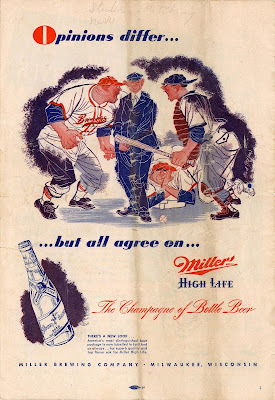 The typography is second only to the radiant and heroic image of a Brewer player. 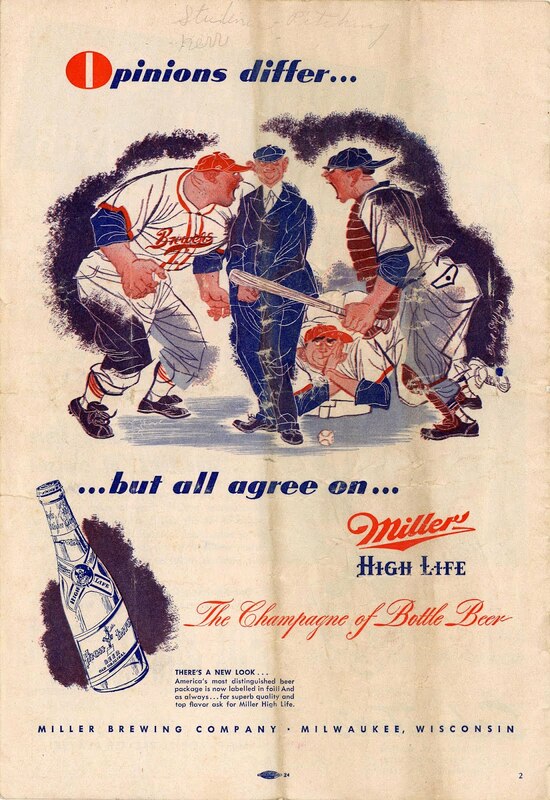 And, on the back cover, Miller High Life brings us back to the "argument with the ump" imagery, this time more an argument in front of the ump rather than with him. 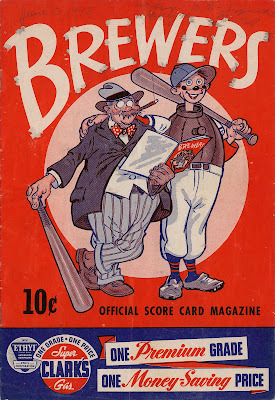 And so we reach the end of another Milwaukee Brewer score card. More to come!